I took a long hiatus from maintaining this blog due to the increasing demands of my doctoral work over 2016. I did not even post pictures during our impressively photogenic Vancouver summer. Concern with the decline of WordPress as a community and platform also played a role. I was permitted to write my dissertation this fall, and last week submitted my first complete draft for internal review. While these are merely the first in a cascade of tests allowing May 2017 graduation, the space in my mind for the surrounding world and for life ahead has measurably opened. World events that need not be named have led me to identify as a citizen of Vancouver more strongly. Although I intend on taking the rare opportunity to travel far after my doctorate is done, my permanent home is coastal British Columbia, or whatever this geographic and political space may come to be named in the years ahead. In particular, I think that the economic forces driving climate change and illiberalism around the world may clear the path to new provincial and civic identities here. Should this occur, I want to document it. But if not, my writing will nonetheless continue as a kind of tribute to the city and region that have sheltered me. The word community is one we hear frequently in the news and in our personal lives. In Vancouver, we might read a story that mentions the business community or the artist community. A controversial development is sometimes said to be opposed by the local community. We even have a network of buildings across the city called community centres! Clearly community is an important thing. So what exactly does it mean? It turns out there is no single definition of what a community is. But people who study communities have come up with a few ideas. Many communities we experience are groups of like-minded individuals, or people with a common practice. The running group you meet every Thursday evening or the knitting circle that you attend every Saturday afternoon are communities, based on common interests. There are also communities related to our vocation. We might feel part of a community of medical professionals in a hospital, or a community of small business owners on a particular street. For example, in my work I’m part of a community of scientists. In my neighbourhood I’m part of a community of gardeners. These communities tend to evolve naturally as we find people who do the same things we do. When people spend time together through hobbies or work, they tend to become familiar with each other. But people who don’t know each other also form communities, sometimes connected by their identities. The community of a specific race or religion may share common needs, challenges, or beliefs that bring them together for advocacy, even if they don’t have specific activities in common. In this sense, a diverse place like Vancouver has many communities of identity, overlapping in countless ways. As a tolerant country, we are fortunate to enjoy a diversity of communities in Canada, bringing a variety of perspectives. But this still doesn’t really get at the full meaning of community, in my mind. When we say a community centre, we don’t just mean a place where people with a certain hobby or identity happen to hang out. While most of us do use community centres for gatherings of this sort, community also means something larger. Community makes us think not only of the people we spend time with, and the people most like us, but of all our neighbours, whether young or old, similar or different. While there is a long menu of activities on offer at a community centre, the broader aim of these places is not merely to share these activities with other people. When we refer to our local community, we seldom mean the people who are only like ourselves. If we say something poses a threat to our community, for example, we mean something much more profound and sweeping. This broader notion of community is based on the idea that everyone counts, and that everyone can contribute. I call it big community. Our small communities play a role in strengthening the connections between us, but big community means that everyone can take part. It is this broad view of community I want to focus on, because whether we realize it or not, it is usually the community we benefit the most from, and the community that is hardest to maintain. It’s also the most tricky to describe. 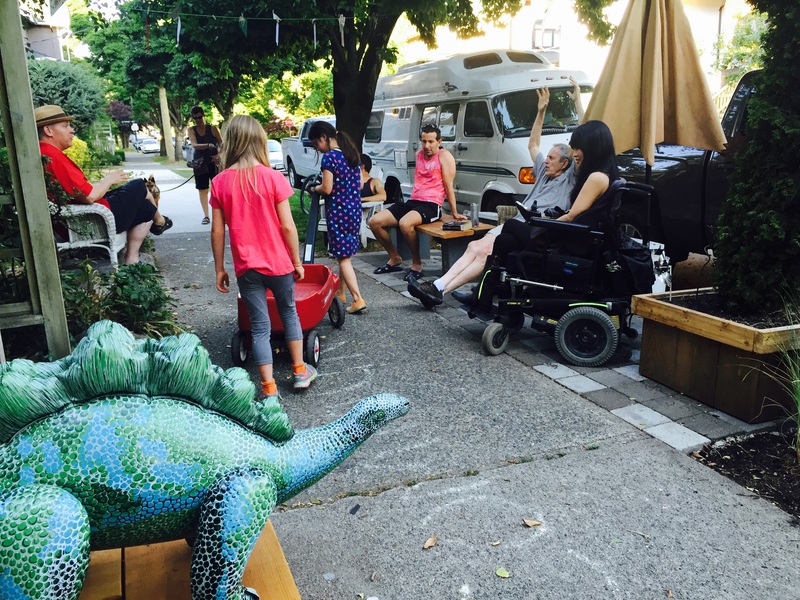 On our leafy Vancouver street we hold an annual block party in June, helped by temporary traffic closures for Car-Free Day. We bring a rabble of lawn chairs and tables out to the pavement, and even a tent in case of rain. Everyone brings food to share, and we chat and get to know each other, sometimes passing hours together in the sunshine. This is the only occasion I have to meet some of my neighbours. While there are familiar faces that my partner and I see throughout the year, there are others I rarely spot on the street. Yet they almost always come to the block party, and I talk with them. We find common ground and laugh, even if only once per year. I linger on this scene because it is one of few local events that illustrate big community in action. Simply by living on the block, everyone is invited to participate. They don’t have to, but they can. Everyone needs food, and just about everyone can prepare it. This is really what is meant by community, in the broad sense. Some needs and relationships are universal to everyone who lives in a particular place. In fact, big community is not necessarily limited to the neighbours on my (or your) block. It can be the city of Vancouver, the country of Canada, or more. The crucial theme is the everyone has a part, whatever the scale. Something else should strike you about the block party: it doesn’t happen for any particular reason or activity, except perhaps to enjoy a sunny afternoon and eat. It doesn’t happen spontaneously. It takes effort and planning, from the permit process allowing us to close the road, to the efforts of my organizing neighbour to advertise, to cooking for people who may not know each other. All this effort makes for a simple gathering of food and chairs for a few hours. Big community takes work. But it pays big dividends. When your grocery bag breaks, when you suffer a fall, or when you lose sight of your child in a crowd, big community steps up. Someone will stop to help. Years ago I was in a dark place, and broke into tears on a park bench. I was astonished when someone stopped to ask me what was wrong, and reassured me that tough times happen to all of us. Big community only happens when we see that everyone around us is at least a little like ourselves, and that we are stronger when we share unspoken ties. Believe it or not, it starts with a block party. What have you done lately to build community? It is a question I ask myself from time to time. Usually I have few good answers. I’m busy with work and life, like most of us. Big community is hard to do. It takes a lot of effort and persistence to include everyone. How can we be expected to fulfill such lofty obligations in our everyday lives? Let’s circle back to small community, because it has an important role as well. It is easier to do activities we enjoy with people we like, and to support people similar to ourselves. But the relationships and values that we build in small communities tend to ripple outwards imperceptibly, and those values can become big ones. Small community is actually the foundation on which big community rests. Being active in local community groups and organizations drives a virtuous cycles that can make us all feel closer to each other. So don’t feel intimidated to jump into big community all at once. Do you have a hobby or idea, but no one to share it with? Start finding others who do. Set up a regular event in your neighbourhood. Discuss common goals and take steps to realize them. Use your local community centre to cast your net wider. (That’s what they’re there for.) Or take the plunge into organizing big community events or volunteering in public services in your neighbourhood. It’s hard to go wrong. Just do something you enjoy that involves other people in a structured way. The planning and organization will always take effort. But the heart and desire should happen naturally. A better question than “what is community” may be “what is my community?” So take a moment to ask yourself the following questions, and write down your answers on a sheet of paper or in the margin of this article. What groups are you involved with, both professionally and recreationally? What do you see as your local community? What are your communities of identity? What is your national community? Reflect on these, and ask which of them you would want to strengthen or change. How? Put yourself in the answers. Because in the big community, everyone has something to contribute, no matter how small. Chris Kay is a biologist and community volunteer. He lives in Kitsilano. 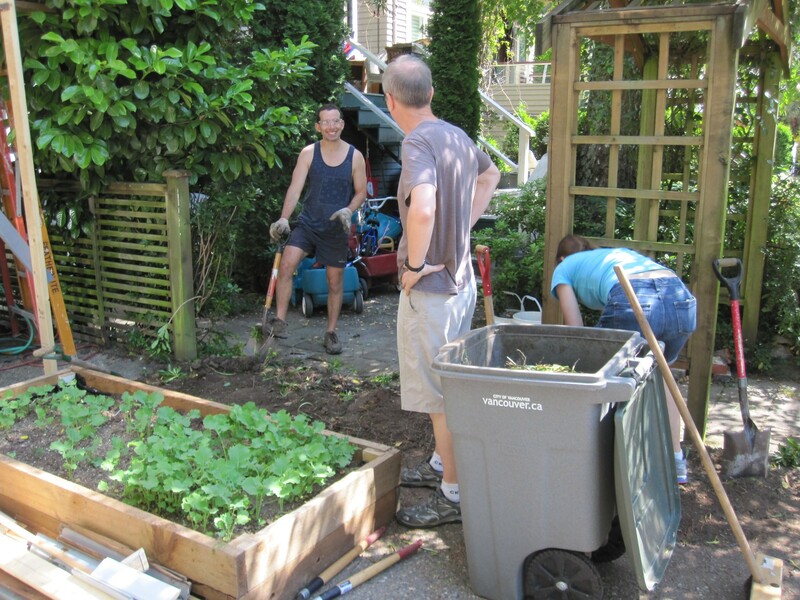 Categories: Vancouver | Tags: community, neighbourhoods, Vancouver, volunteering | Permalink. Found at Broadway and Larch. The earliest flowers of spring have emerged, marking the way to 33 Acres on a sunny patio. Categories: Vancouver | Tags: Kitsilano, photography, spring, summer, Vancouver, weather | Permalink. Working at the Kitsilano Collaborative Garden this past weekend, we were approached by a few passing patrons of the Community Centre. A silver-haired woman in colourful clothing and friendly mood tentatively inspected a bed of perennials near the sidewalk. “I like how you’ve separated the soil with rocks. I was thinking of doing that in my garden!” I encouraged her to try bricks instead. The crushed rock was cheaper, but seems to perpetually fall out of place. “So do you live nearby?” I asked. I had encountered the typical Kits Boomer. She bought around 1980, as the neighbourhood emerged from boarding house dilapidation to heritage desirability. She has a room full of books. She carries a distinctive beads-and-granola air. She knows her neighbours and has always loved living here. But she’s tired of taking care of an aging house, and wonders if she should cash out. The classic Kits Boomer dilemma. Some have chosen to take the money and move on. Others have become reluctant landlords. A few have even hired developers to restore and stratify, where zoning allows it. But I suspect most will simply stay put, perhaps deferring property taxes. Which leads me to the next thought: what will happen as the Kits Boomers pass away? Will their children inherit the homes? Will the neighbourhood become wealthy legacy families and UBC students only? Or will the lure of investor money, assuming no collapse of home values, be irresistible to their benefactors? Will Kitsilano retain its latent values of environmentalism and progressive politics — already under threat — as the aging personalities of the counterculture disappear? I like to think of my block as one small bulwark against the demise of Kitsilano as a healthy and conscious community. But I see how many Kits Boomers number among my neighbours. What will my community be like when they are gone? Categories: Vancouver | Tags: community, Kitsilano, reflections, Vancouver | Permalink. 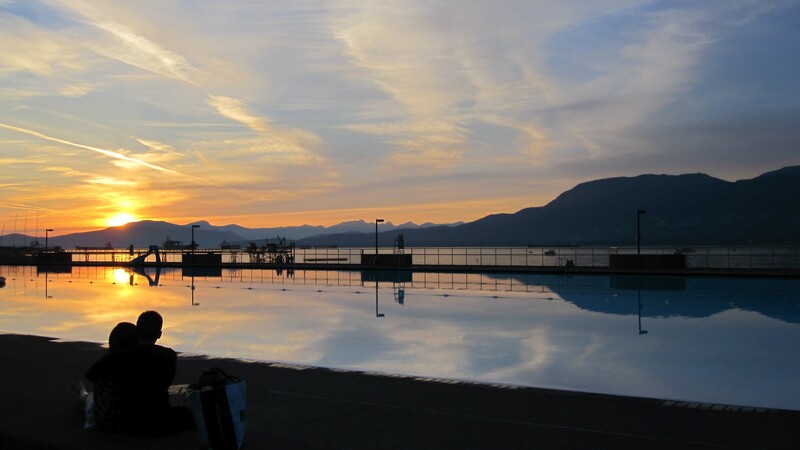 Kitsilano Pool at closing is a world-class panorama. What has always inspired me most about the place is not the unrivaled view, but the tremendous ambition of constructing a public pool along one of the most scenic plots of shoreline in the city. Sometimes I wonder: is real estate freakishly expensive in Vancouver in part because the world has realized how rare and spectacular a place this is? See previous Vancouver Pillow Shots here. Categories: Vancouver | Tags: kitsilano pool, photography, pillow shots, real estate, summer | Permalink. The weather in Vancouver has been glorious this summer, but something if not rain had to dampen the mood. 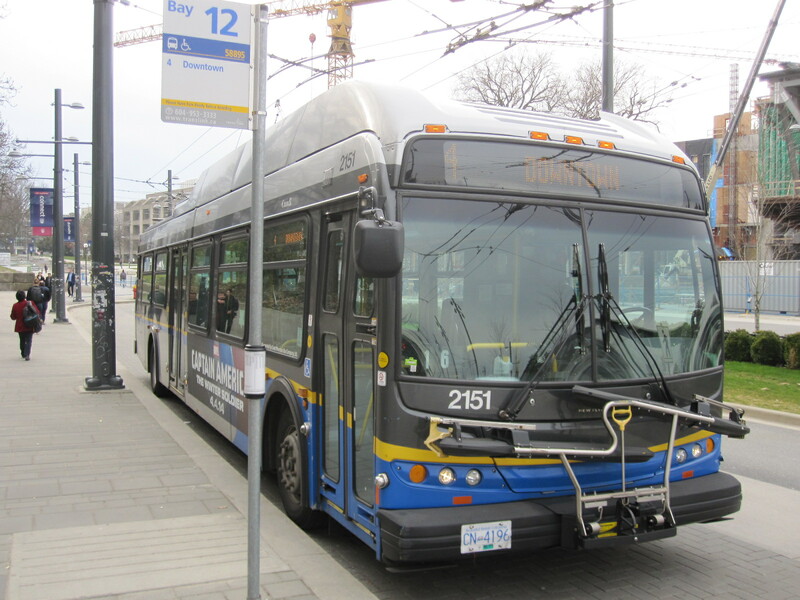 Last Thursday we learned that the transit referendum had failed. Decades of regional transportation directives have, to pardon the impolitic wildfire pun, gone up in smoke. In the immediate aftermath, Michal Rozworski criticized the Yes campaign for sticking to “severely-limited, feel-good, paternalistic liberalism”, and failing to stand on the social politics of transit. This is nowhere more apparent than downtown Vancouver, the heartland of the city’s centre-left elite, where the campaign had little to do with connecting people to their workplaces and everything to do with a continued legacy of progressive urbanism. The loss was interpreted as a repudiation of decades of technocratic planning, anchored in False Creek, by encroaching hordes of clueless suburbanites. Pete McMartin’s polemic against the No vote, soaked with despair over the implied rejection of Vancouverism, drew many puzzled comments in the Vancouver Sun. “What the hell is Vancouverism?” wrote one No voter. “I have never heard that word used to describe Vancouver”. Gordon Price went so far as to characterize the referendum as a public expression of our civic identity. Under this interpretation, the resounding message is that Metro Vancouver wants to drive, regardless of what Vancouverism has come to signify or what its proponents believe. Don’t panic. While the Broadway subway was a key plank of the transit package, the tangible effects of the referendum loss in Lotusland — most of Vancouver proper — will be comparatively small. We retain a dense fabric of frequent trolleys, express buses that function despite limited capacity, and a growing network of bikeways to serve a rapidly shifting mode share. “What’s really going to change for us if the referendum fails?” my partner mused once the gloomy outcome grew clearer. “We already bike everywhere.” If anything, the greatest impacts fall on the suburban drivers who voted against the tax, where transit will be unable to keep up with rapid changes in land-use. Barring the end of the ALR, Metro Vancouver suburbs are all going to grow more dense. A drive around Richmond or Surrey reveals a surprising abundance of multifamily housing, and more are on the way. Residents of these sprouting south-of-Fraser townhouse developments will now have little choice about getting around: they will have to drive. To rudely paraphrase George Orwell, imagine traffic running over a human face, forever. That’s the foreseeable future of transit in Metro Vancouver where it does not currently exist. Like many engaged local commentators, Paul Hillsdon views the referendum loss though the prism of political failure, a perpetual funding hot-potato that no one in office wants to own. The roots of this conflict run to the foundation of Translink as Gordon Campbell’s vehicle for sidestepping the Metro Vancouver mayors, many years before Canada Line and the 2010 Winter Olympics. Antipathy of Metro Vancouver governments to an imposed Translink management, who they were then cruelly forced to back in the referendum by a hostile Province, doomed the Yes coalition from the start. No united message could possibly emerge from this uneasy partnership, and no leadership of the Yes vote was forthcoming, least of all from the Province. Christy Clark claimed to support a Yes vote under duress of a microphone, but she could not plausibly give a different answer given her role in starting the referendum circus. (She was unavailable for comment once it failed.) The best the pro-tax coalition could do to rally the Lower Mainland vote was Mayor Robertson, the mythical personification of a self-absorbed Vancouver that surrounding municipalities make sport to ridicule. In a sense, this clinical view of the referendum’s political pathology is still more disturbing than the purported ignorance of suburban rabble. It means not merely that a large portion of the population opposes crucial improvements to the transit network, but that the political elites themselves are unable to form a consensus and indeed are too cynically mired in cycles of retribution to make tangible progress. Blame is ultimately directed at the BC Liberals, or the provincial government in abstract, with vague hope of redemption in the 2017 election. But that’s a long way off to make Christy pay, a lifetime in politics, and offers cold comfort to those whose day jobs are to press for a unified transportation strategy to meet inevitably rising demand. The few times I have used transit I found it inconvenient, dirty and unpleasant. Even diehard greenies in this town ride their bikes to avoid it. People want cars. They want good roads. They do not want to be told to take a bus by some holier than thou types who condemn drivers’ legitimate choices. WE are Vancouver. We drive. We also vote. There is perhaps a dose of magical thinking in the Dream City echo chamber. We have spent decades reinforcing the idea that people are willing to live in small apartments provided an urban environment that obviates the need for a car. We’ve pointed to Europe and Asia, invoking a kind of universal model that we can achieve in North America with enough foresight and will. The most strongly felt disappointment of the referendum loss is to dampen this hope, to seed worry that Vancouver is really just a North American city like any other, perhaps with a few lucky perks of landscape, climate, and history. That people here really want to drive on big, fast roads for everything, like innumerable other sprawling North American municipalities, excepting a few token walkable districts with abundant parking. Buses, sure, but not too many and only for the poor. All that theory about livable, walkable neighbourhoods? A load of elitist tripe for those who can afford it. I strongly reject this fatalism, and I hope you do too. The population of the downtown peninsula has nearly tripled since the start of the modern Vancouver experiment, and jobs have roughly doubled, while traffic volumes into and out of the city centre have continuously declined to the lowest levels since 1965. Mode share has dramatically shifted, with over half of Vancouver’s trips made by means other than an automobile, six years ahead of the Greenest City 2020 goal. Land has spiked in value, but the inflation-adjusted cost of an apartment in Vancouver proper has barely risen in a decade. As I have voiced before, I strongly support increased density in our residential districts to ensure more, varied, and affordable housing stock for future residents of our city — see (1), (2), and (3). That surrounding municipalities do not want to emulate the successes of Vancouver does not negate the radical progress our city has made in shifting the way people inhabit the urban fabric. Communities in Metro Vancouver that most need density for rising populations are precisely those who voted against the sales tax by the widest margins. These cities didn’t negate Vancouverism — they are merely ignoring its lessons and making some mistakes that Vancouver has sought to remedy or avoid. The last and possibly most pernicious issue is the fate of Translink. The referendum laid bare the public disdain for the agency, a result of smear campaigns, poor public relations, and provincial neglect. Vancouver has many tools at its disposal for implementing a progressive urban vision within its borders, but the governance of Translink dictates that public transportation is not currently among them. Bike lanes have gone further than many of us imagined to change the way people get around Vancouver, but it can only go so far, both physically and in abstract. Bicycles cannot connect cities in a sea of green. In the wake to the failed referendum, it is really the Livable Region Strategic Plan, and successor Regional Growth Strategy, that remain threatened. Rebuked by the suburbs, will Translink focus resources on Vancouver, where routes are more profitable? Will the mayors simply boycott Translink until voters turn their ire on Victoria, or is this too dangerous a game against the provincial hand that feeds? Will changes in the federal government, a likely possibility in the autumn, open paths to direct investment in Vancouver and Surrey? If so, how will Translink fit into the picture? Sadly, we have not seen the end of brinksmanship over transit in Vancouver, and we have not yet witnessed a sea change in Translink. Regardless the outcome of specific battles to come, it seems like the era of a unified Metro Vancouver transportation plan may be drawing to a close. Categories: Vancouver | Tags: buses, density, development, downtown, government, infrastructure, rapid transit, transit, transit planning, Translink, urban planning, Vancouver, Vancouverism | Permalink. Tear down that hedge, Mr. Gorbachev! Some weeks ago we hatched a neighbourhood project in placemaking. The catalyst was twofold. First, to make a permanent, inviting space along the sidewalk and verge where adults and children alike tended to gather. Second, to shake up the surrounding streetscape with a measure of openness and eccentricity. Small talk led to suggestions, until we all expressed the sense that our corner of Kitsilano could use a dose of community and art. First to go was the imposing cedar hedge that separated our adjoining properties. We replaced the cedars with a short row of Portuguese Laurel, and added a raised vegetable bed on our driveway to benefit from the improved sunlight. Framing the laurels, our neighbour Michael built an L-shaped bench from hemlock, cedar, and fir. A shared space could then spill around both houses for flexible use. Across the sidewalk, the heart of our project soon began. We had used the grassy strip beside the sidewalk as a kind of impromptu outdoor living room for a season or two, leaving out deck chairs and lawn furniture for sunny days. Eventually Michael set a bench on concrete anchors, but the patchy sod was still a wet inconvenience. With the help of a Neighbourhood Small Grant, we decided to pull out the grass and create a kind of plaza to focus the block. 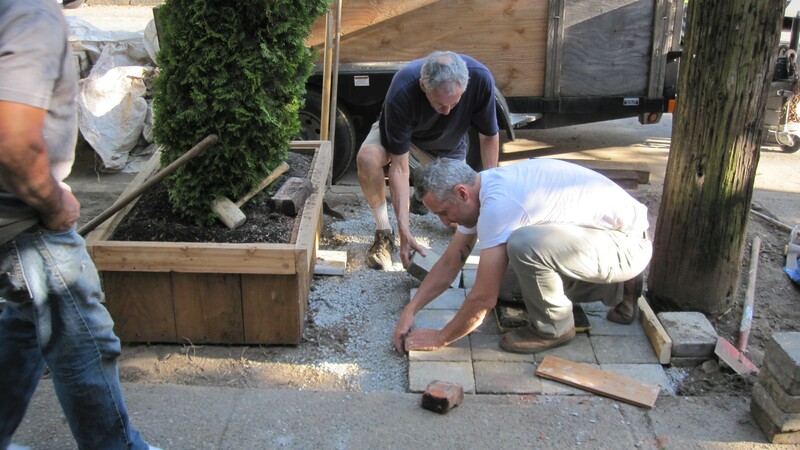 I spent one hot Saturday chopping out the sod and roots, and Chris provided pavers for us all to try laying. Just about everyone set at least one. 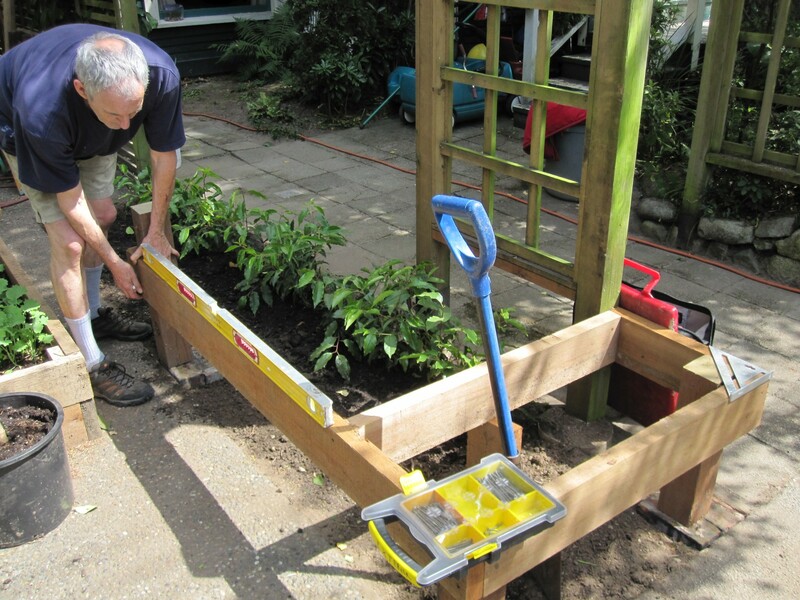 Beyond the physical improvement of space, we’re sharing intangible know-how of carpentry, gardening, and landscaping. We’re also sharing ideas, laughs, and food, gathering interest from the rest of the community as the space continues to evolve. Dog walkers and locals with grocery bags sometimes stop to ask what we’re doing, along with many smiles and murmurs of approval. “You guys are doing it right!” said one Kitsilano tank-top dude, motioning thumbs up. Up next: the art projects. See our fun-loving dinosaur pictured below? He will soon be transformed into a Gaudi-inspired trencadís sculpture to liven the street. He will accompany a tall, standing bear crafted from cedar topiary — his feet visible in the photo above — a kind of nod to the staid hedge that once divided us. 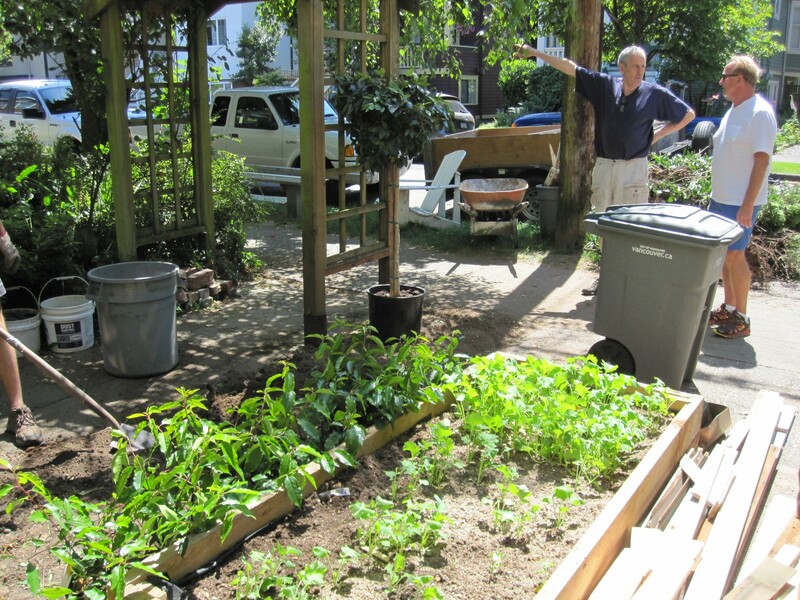 Categories: Vancouver | Tags: community, gardens, Kitsilano, placemaking, Vancouver | Permalink. All images and text © Chris Kay and Reflecting Vancouver, 2015.